CORRECTION: 12/15/2011 The cord I purchased was 1.8 mm, not 1.4mm (as previously stated). I’ve looked for years for just the right kind of cord for my pendants. Most of the colored cords I’ve found have been too bright. I found some black cord but it didn’t look right because there wasn’t any black in my pendants. Other cords were too stiff, too shiny, or frayed too easily or had something else wrong with them. Then I remembered that a number of years previously Jacqueline Lee had told me she used window blind cord for the pendants she sells in museums; she even told me where to get it: RW Rope online. 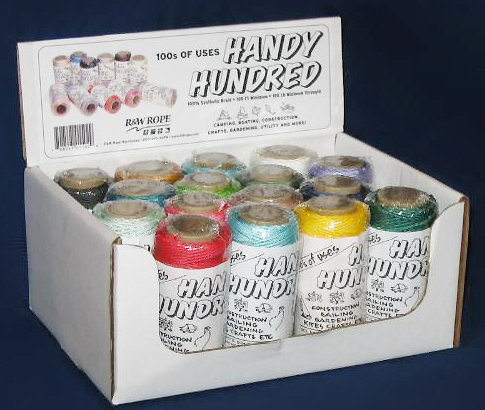 She said to ask for the “handy hundred” cord, which I did. It is excellent cord but color availability varies because the the cord is ends from rolls used in a window covering factory It comes in 4 diameters (I got the largest 1.8 mm) and the price is excellent. Unfortunately very few of the colors I was looking for were available. I called the very helpful people at RW to see if other sizes and colors were available. I was told I could get cord in a wide variety of sizes and colors for practically nothing if I ordered a box of assorted ends from the cutting room. So I did. The shipping cost almost as much as the cord. This is what it looked like when I pulled it out of the box. 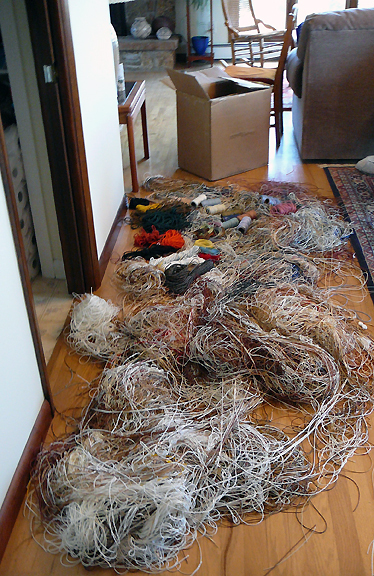 Some of the cord was on spools, some in hanks and the rest was in a huge tangle. I did get some very nice colors but they comprised about 2% of the cord in the box and I spent quite a bit of time untangling it. Now that I had all this cord, I couldn’t just throw it away, so I decided to dye it. This wasn’t as straightforward as I thought it would be. The cord is made of synthetic materials such as polyester and most dyes will only dye natural fibers. 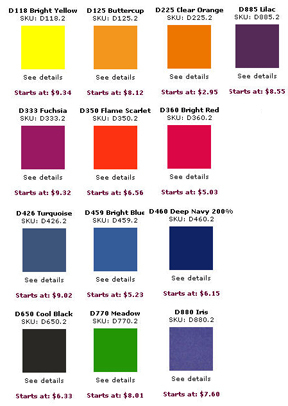 After quite a bit of research, I came across a company called Pro Chemical and Dye on the internet. They sell all kinds of dyes for various uses and one of them, called Pro-Disperse dye, comes in 12 colors and was just what I needed. Its main drawback is that it is nasty stuff chemically. It is necessary to boil the cord in the dye along with some other chemicals, producing fumes that that you don’t want to breathe. 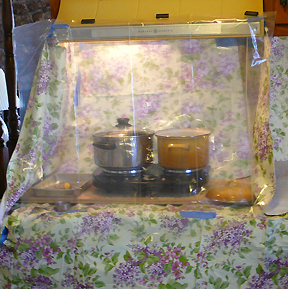 Since it was midwinter and I couldn’t work outside, I turned the stove top area in my kitchen into an exhaust hood by surrounding the stove and exhaust fan with plastic sheets. This worked pretty well. 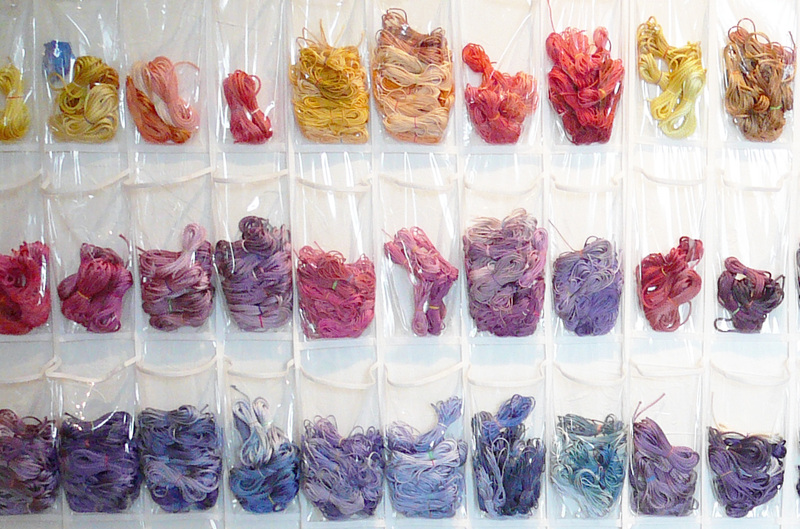 I dyed cord of different colors as well as white cord and got a wide range of colors. Many of them were somewhat muted, which I wanted. Sometimes I redyed cord in a different color. 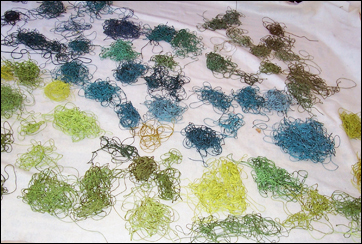 Once the cord was dyed, it had to be rinsed several times. Then I had to find a way to dry it. I settled for dropping it in piles of different colors on an old blanket. The cords on the wall are sorted by color; this is about one-fifth of them. This entry was posted in Color, Cord, Technique and tagged export. Bookmark the permalink.